Auto body shops and trade schools looking to hire and foster the next generation of technicians might want to take a note from some of the biggest players in the business. ABRA, Caliber, Service King and the Society of Collision Repair Specialists all manned booths at the second annual SEMA job fair, held Oct. 30, 2017, immediately prior to the show. Their experiences and insights into that recruiting experience might help collision repair colleagues, competitors and educators help solve one of the industry’s top problems — finding and retaining quality personnel. ABRA recruiter Shontay Porter said the MSO’s table was “very busy.” However, she described students as showing “semi-interest” and not really bringing resumes or requesting ABRA business cards. Given the nature of SEMA, we asked if students were interested specifically in collision or another automotive aftermarket field. Porter said some candidates were interested in regular automotive repair and “on the cusp” if they wanted to pursue collision, but after talking to the ABRA staffers might have felt a greater pull towards the industry. 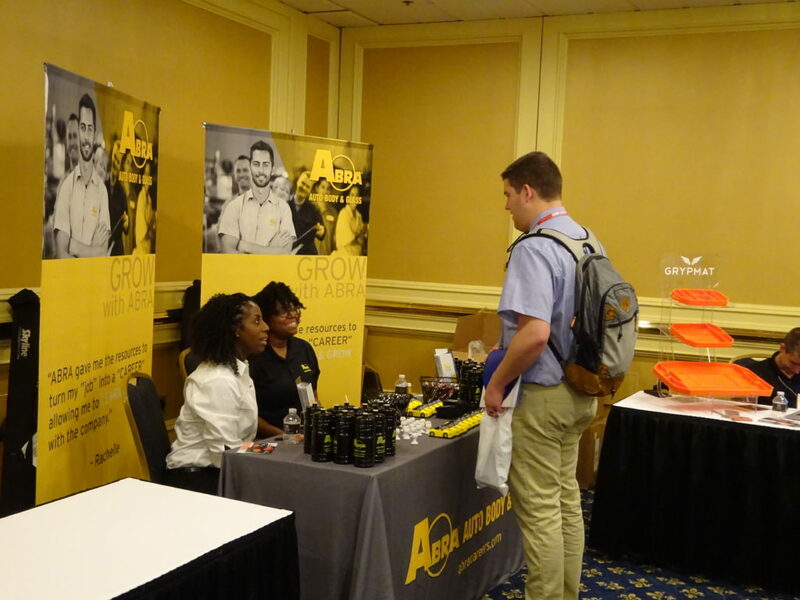 Students patronizing the booth primarily expressed interest in roles as body technicians and painters, but ABRA did see a couple of prospective estimators — and even a candidate who asked about an HR job there, according to Porter. The show “definitely” helped get ABRA’s brand across to areas the company hadn’t yet reached, a sentiment the other MSOs shared. “We did have a lot of people that are looking in places where we aren’t yet,” she said. ABRA didn’t offer any jobs on the spot, Porter said. 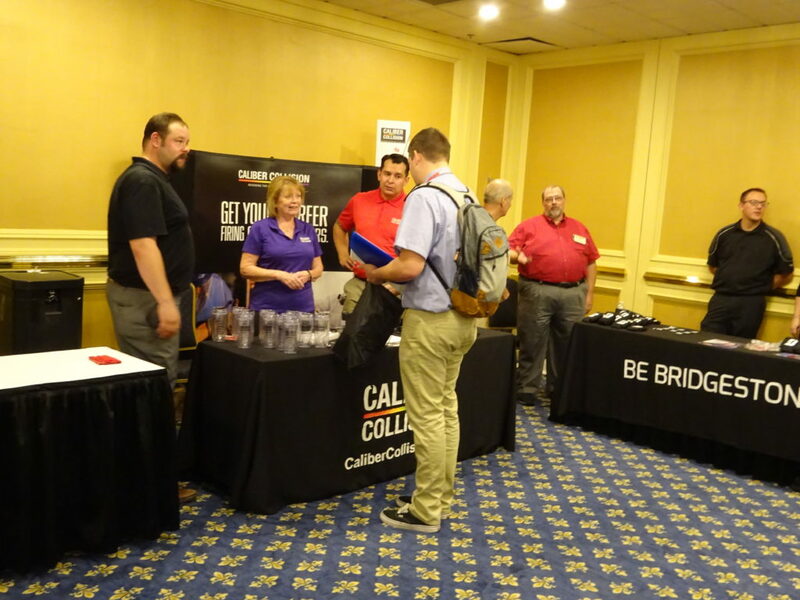 Caliber recruiter Nick Cortez said the SEMA job fair, Caliber’s first, was successful in that “it gave us a platform.” Students from some areas into which the large MSO hadn’t yet expanded had a chance to encounter the brand. “It really gave us exposure,” he said. Another plus for Caliber given its size was its opportunity to promote careers besides the typical body technician opening, according to Cortez. For example, some students were interested in information technology, and Caliber is large enough that it has in-house IT staff. Caliber recruiter Corey Donaldson said he talked to a couple of students within an automotive management program. “Mainly, for the most part, everybody was interested in collision,” Cortez said. Caliber didn’t offer any jobs on the spot, but planned to follow up with candidates. Field human resources manager Jan Whitley said visitors appeared to be well-informed and prepared for the event. Despite candidates having gone to vo-tech schools rather than entering the field cold, Service King area leader Truiet Hendrix said many students were interested in the company’s apprentice program. “They think its really a great thing,” Hendrix said — particularly given Service King’s gift of tools and a toolbox to apprentices. “That’s a lot of incentive right there,” he said. He said that four apprentices were on track to graduate in January 2018. “Shops are already fighting over them,” he said. Service King reported students were focused on collision repair, rather than sexier industries like hot rods. Las Vegas quality assurance head Wayne Wendland said he was “a little shocked” to find many booth visitors asked about OEM training and keeping up with vehicle technology. Job seekers asked about concepts like Teslas and the changing nature of automotive steels, he said. 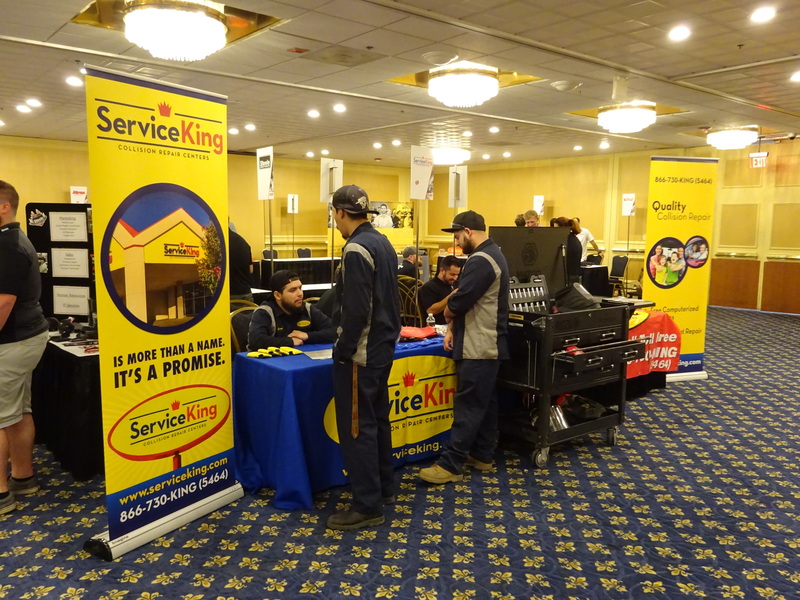 The event also seemed to raise the Service King brand’s exposure. While Wendland said some candidates had heard of the company, Hendrix said many visitors were curious if Service King had branches in their hometown. 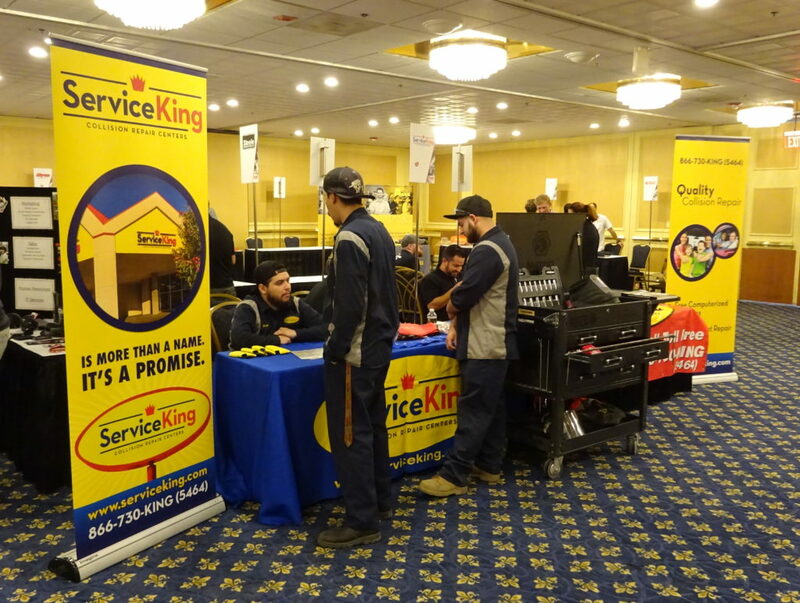 Hendrix said that rather than make offers on the spot, Service King mostly just collected candidate information for review off-site. With the investment it makes in personnel, it wanted to be sure an applicant would buy in to the company’s mindset, he said. Society of Collision Repair Specialists Chairman Kye Yeung (European Motor Car Works) and Treasurer Amber Alley (Barsotti’s Body and Fender), manned SCRS’ booth. The trade group attended to promote the general concept of careers in the collision industry and perhaps sway some of the job seekers toward the trade. “It was neat kind of opening their horizons with that,” Yeung said. Yeung and Alley shared other elements of the sales pitch, which shops might want to use in their own recruiting. Yeung said SCRS sought to stress that collision repair no longer fell into the stereotype of a body shop caked with dirt and dust — they were now “high-tech” facilities. A better job of promoting that was needed, she said, particularly given the number of shops now offering in-house training. “That’s becoming more the norm,” she said. At the same time, “I think we need to be more direct with the kids coming out of the schools,” she said. Students with college debt might expect to make more than is realistic, and as technical colleges can also inflate students’ sense of their immediate earning potential post-graduation, according to Alley. Neither Alley nor Yeung encountered job-seekers opposed to the idea of collision as a career. One of the greatest benefits for the association might have been connections made with the trade schools attending the event. Alley said vo-tech programs were “really excited” to learn more about SCRS. “They definitely seemed like that they were interested in learning more about the industry,” she said. 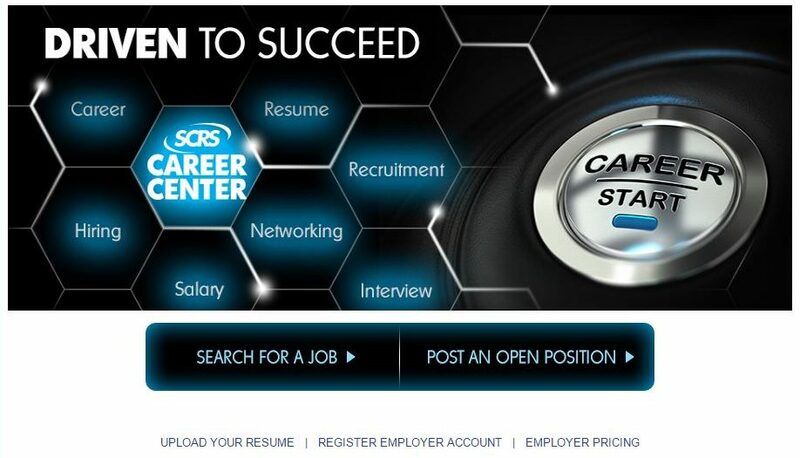 Many said they would promote the SCRS.com/jobs Career Center website, she said. Some schools, notably Cal State University-San Bernadino, stood out for bringing students in fields other than the automotive departments to the show, according to Alley. Yeung gave the example of CSU-Bernadino trying to place an accounting major and SCRS offering suggestions such as body shop administration, where that background would provide value. The SCRS message: “‘Don’t be so focused just on that one label. '” All aspects of business could use such job skills, he said. One major takeaway involved the number of young people seeking internship information, according to Yeung. Some vo-tech schools required students to secure a certain number of hours within the industry, according to Alley; she and Yeung recalled 60 and 120 hours being mentioned by SCRS booth visitors. Internship postings would be a good addition to the SCRS Career Center board, Alley mused. “We need to figure out a way to get that message out to shops,” she said. How to incorporate internships required a little thought, as “bringing someone can be a little disruptive” if the shop isn’t prepared. Pettit noted that in the past, fledgling technicians like his apprentices faced obstacles like being a helper and having to be trained in between a piece-rate body technician’s time spent making money. The apprentice supervisor said he is not a Service King commission employee. Yeung said he also discussed the idea of a body which reaches out to trade schools and explains what curriculum would be useful. Often, students graduate, “think they’re well-prepared,” but aren’t ready for real-world shop situations.